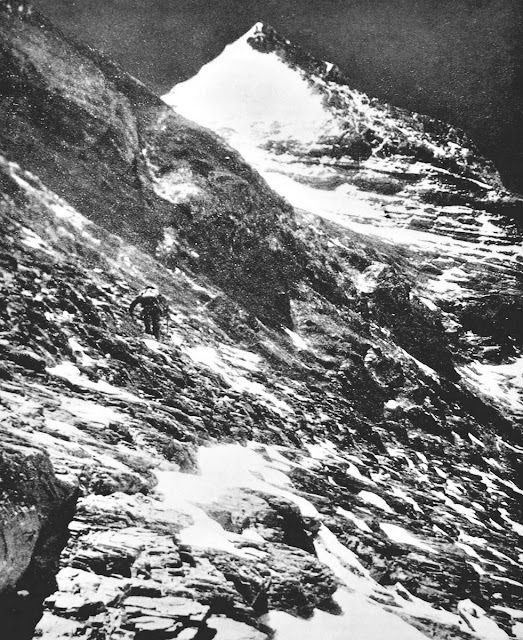 On 8th June 1924, two men left Camp VI (26,700 feet) to make an attempt on the summit of Everest. 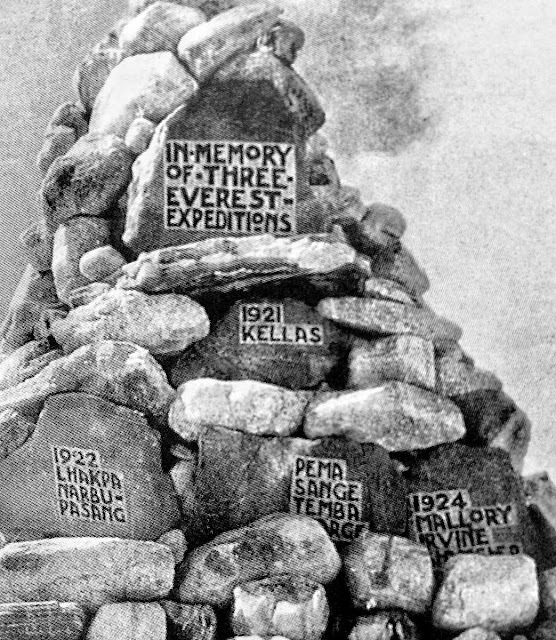 Camp VI was the highest camp of the British 1924 Everest expedition. On the same morning, another British climber, Noel Odell, was making his way up from Camp IV to Camp VI. Odell was a geologist and he was collecting fossils from the slopes of Mount Everest. Odell recalls that it was not the perfect morning to climb Everest. " Rolling banks of mist" were sweeping across the mountain and covering the north face. Neither the face nor the summit ridge could be seen by Odell. There was also a sharp wind which was making climbing very difficult. Suddenly at 12.50 pm the mist cleared and Odell spotted high above on the ridge, a black dot climbing a rock step, which Odell at that point identified as the Second Step. Soon after Odell saw another black dot following the first black dot. But before Odell could be sure that the second black dot had joined the first, the mist rolled in and blanketed the mountain and this fantastic vision was lost forever. 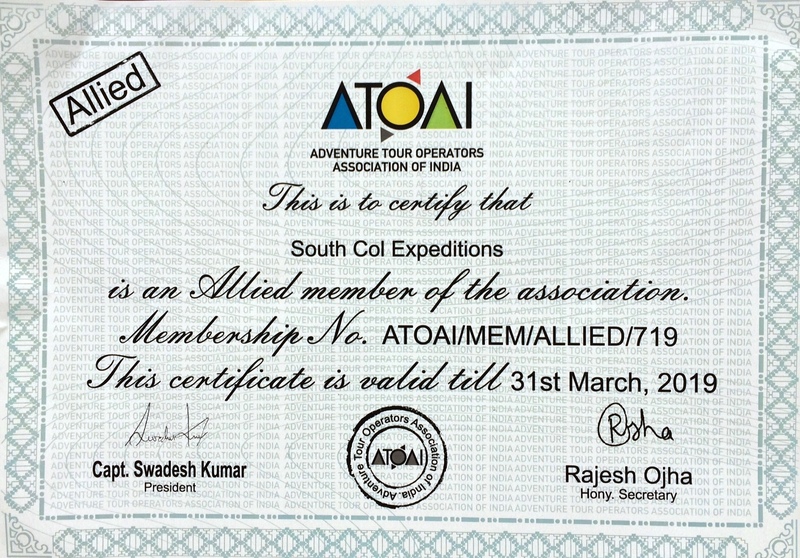 The two dots that Odell saw were George Mallory and Andrew Irvine "going strongly for the summit of Everest". Mallory and Irvine were never seen again. 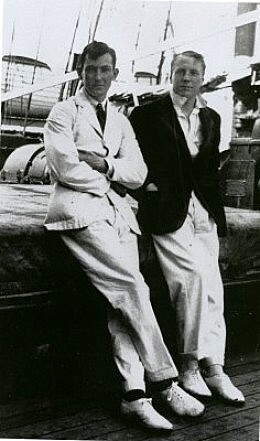 But even today, ninety three years after the disappearance of Mallory and Irvine, the legend of Mallory is still alive. Books are being written about Mallory, expeditions are being planned to find Andrew Irvine and his camera because Everest experts believe that the camera will unlock the secret of Mallory's last climb. In this post we take a look at some photographs and other memorabilia from the Everest expeditions of 1921, 1922 and 1924. Members of the 1924 expedition - Standing from left Irvine, Mallory, Norton, Odell, Macdonald. In front: Shebbeare, Bruce, Somervell, Beetham. Members not in the photo : Noel, Hingston, Hazard. 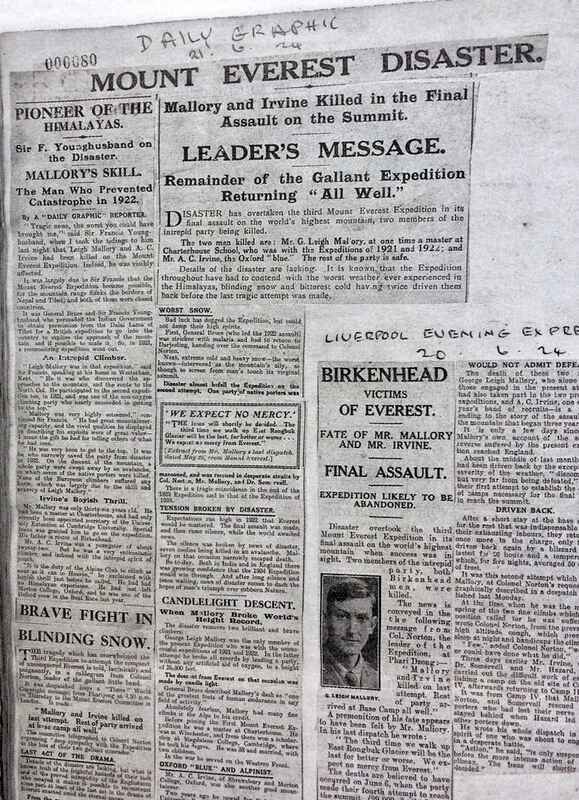 The list of provisions for the summit climb found on Mallory's body - he planned to be on 2 cylinders of oxygen. Please note the rations on the left! All photographs reproduced above are copyright of Royal Geographical Society, John Noel Photographic Collection and their respective owners. I have always felt that they either made it to the summit, or died in the attempt. I don't believe Mallory would have given up at that point, even in the knowledge that going on meant certain death. Yes Mick he said he could not see himself coming down undefeated. Unless they happen to find that camera, we'll never know for sure, I suppose. But I imagine the excitement - and controversy - if it is found and it shows then on the summit! 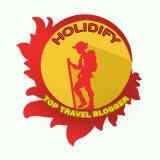 This is a very nice blog.I like your trekking which seems to be very adventures.Great efforts.